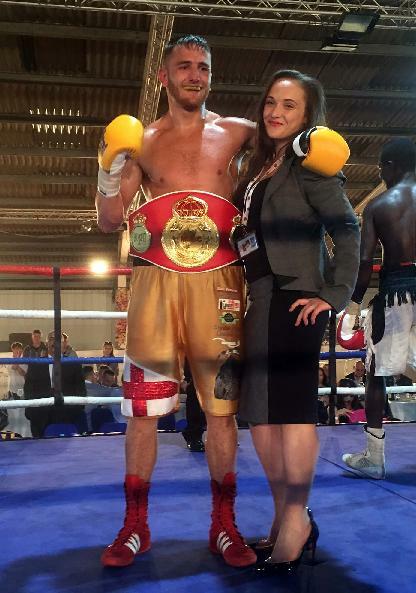 On Saturday night, at the Arena UK in Grantham, Lincolnshire, local gym owner Russ Brown made his maiden outing as a professional boxing promoter and boy oh boy did he do it in style. Whilst most people would start off at a small hall venue with a few local ticket sellers heading up the show, Russ Brown approached it a little differently, a full blown Arena show headed up with Championship bouts headlining, originally was due to be three, but due to last minute visa issues the main event, the World Super Bantamweight Unification contest between South Africa’s reigning World Boxing Federation Champion Gabisile Tshabalala and British #1 and current MBC International Champion Marianne Marston, had to be rescheduled so the irritating bureaucracy issue could be sorted. With no Tshabalala-Marston World Unification bout, it was local unbeaten star Nathan Decastro, in his first title battle, against the highly experienced Championship campaigner Ishmael Tetteh, from Ghana, for the vacant MBC International Super Middleweight Championship that was elevated to headline the show. Before I get onto the fights themselves I have to say how pleasant it was to be at an event where the entire audience welcomed each and every fighter to the ring with rapturous applause, that included Tetteh, who they welcomed in the manner a star fighter deserved and not a single jeer or boo to be heard. However that paled into insignificance compared to the reception local star Decastro received, the sound was deafening and it seemed that each and every person in the arena was cheering on their man at the top of their voice as he made his ring walk. The vocal support continued throughout the fight itself, with the fans ringside cheering every exchange, and believe me there were plenty as this was an exceptional all out toe-to-toe war that could have been fought in a phone box. Young Decastro wasn’t overawed, far from it, instead he rose to the occasion and showcased the exceptional skills that belie his tender years. Don’t get me wrong this wasn’t a one way affair, Tetteh is a tough, classy operator that gives his all for every second of every round and he was in sensational form, matching the local lad punch for punch in the early rounds. The turning point in the contest came midway through the fourth, Decastro landed a wicked body shot that sent the Ghanaian down to the canvas. Tetteh is as tough as they come and just as World class referee Richie Davies reached the seven count made his way to his feet. On the restart Tetteh went hard on the attack, however Decastro’s ring-craft soon came into play, spinning Tetteh so it was him with his back against the ropes and the Lincolnshire lad once more in control. Round five was a virtual repeat of the fourth, both fighters standing toe-to toe, letting rip with huge shots to body and head right from the off. As in the previous round around the midway mark Decastro let rip with a big combination culminating with a vicious body shot to send Tetteh down to the canvas once more, this time though there was no chance that the tough Ghanaian would recover sufficiently to beat Richie Davies’ count. The overjoyed crowd went ballistic as Decastro was presented the MBC International Championship belt by Vice Chairman, Ms. Jennifer Burton and the celebrations went on for a good forty minutes or so. On a side note I doubt there are many times in a boxers career that they are inundated with requests of hand shakes or selfies from fans of the opposition, but Ishmael Tetteh was, even in defeat he must have felt like the champion, quite rightly so in my opinion as he gave his all throughout the contest and made this a fight to remember. The second Championship bout was for a World Boxing Union (WBU) UK Regional title, contested by big hitting local lad Gary Silverman and Belfast’s Marty Kayes. The Belfast man’s performance was sublime, when not on the inside Kayes’ busy movement made life exceptionally hard for Silverman. Throughout the bout Silverman switched tactics in an attempt to give himself the space to let rip with his patented power shots, however each time he did Kayes would find a way to neutralize any advantage the Grantham lad had gained. After eight rounds of highly entertaining boxing it came as no surprise that Richie Davies’ scorecard read 80-73 in favour of Belfast’s Marty Kayes. Prior to Silverman-Kayes was a sensationally closely matched Cruiserweight contest between Dainius Becelis and James Higgy. I’m a huge fan of the Cruiserweight division, mainly due to such stars as two time IBF World Champ Steve ‘USS’ Cunningham and former WBO, WBC & WBA Champion David Haye, who dominated the division back in the late noughties. In fact I love the Cruiserweights so much that a few years ago I wrote and had published the full history of the division. Anyway that aside, on Saturday night I was overjoyed to watch two future stars of the division in action and what a closely fought contest it was. I always hoped that one day Steve Cunningham and David Haye would fight each other as it would have been an all action affair, a true showcase for this exciting but underrated division. Well that never happened but if it had it would have been very similar to the Becelis-Higgy bout without doubt, so you can imagine how chuffed I was to be ringside for it. Yes it was that good. It really was a cracking, closely fought, all action affair, so much so by the start of fourth round I couldn’t separate them and honestly expected it to end up a draw, however Becelis managed to pull off a very close victory due to his performance in the final round, don’t get me wrong Higgy performed brilliantly in the fourth too, just Becelis stepped it up enough to secure the win. Definitely Fight of the Night in my view. After four of the most exciting rounds of boxing I have seen in a long, long while Referee Matt Scriven scorecards read 39-38 in favour of Dainius Becelis – side note: the referee’s scorecards read 1st Round 10-9 in favour of Becelis, 2nd round 9-10 in favour of Higgy, 3rd round was drawn and of course round four 10-9 to Becilis. Prior to the Becelis-Higgy bout was another closely fought contest, this time a four round middleweight bout between local lad Scott Newcombe and Stockport, Cheshire’s Will Cairns. As with Becelis-Higgy this was another well matched all action affair that could so easily have ended up a draw, just in this case Cairns superb performance in the early rounds was enough to see him secure the bout by a single point. Referee Matt Scriven scoring it 39-38 for Will Cairns. The second pro bout of the night see Michael Robinson take on Scunthorpe’s Andy Pirie in a Middleweight contest. It’s proving hard for me to come up with enough superlatives as each fight on the show were superbly well matched. As with the Newcombe-Cairns or the Becilis-Higgy bouts, this was another that could have gone either way as both warriors gave their all for every second of each and every round and it really was hard to separate them, performance or points wise, clearly not just myself as Referee Matt Scriven scored it a 39-39 draw. The opening bout of the night see Grantham’s Mickey Blackburn in action against Hyde, Cheshire’s Will O’Reilly in a four round Super Welterweight contest. Once again the matching was spot on, and as with each and every fight on the night was a closely fought and highly exciting affair, so much so that after four enthralling rounds it really was hard to call a winner, again not just myself as Referee Matt Scriven clearly had the same dilemma as he scored it a 39-39 draw. After the show promoter Russ Brown said. “Other than the disappointment on not having Marianne (Marston) fight, the show was spot on. I wanted my lads to be in competitive fights, and they were, yes I know a couple lost or drew their fights but so it goes. To my mind this is professional boxing and if they are going to make it to the top they need to have competitive fights and they did. I’m really pleased the way the show went and would like to thank the BIBA (British & Irish Boxing Authority) officials who did a great job, especially the referees Richie Davies and Matt Scriven, who were spot on with their scoring. Have to congratulate Russ Brown and his team for not just hosting a superb event but also for the matching, It really is a breath of fresh air that a promoter doesn’t try to ‘build’ his fighters careers by having them face ‘journeymen’ for the first ten fights or so, instead preferring his lads to face proven young fighters right from the off, you just don’t see that very often these days.